A land where East meets West, where twelve civilizations have been born. Turkey�s diversity of climate, scenery and culture is outstanding. 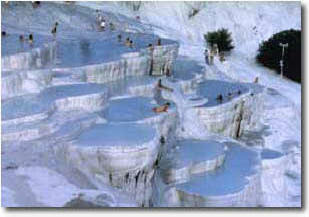 With its Mediterranean and moderate temperature, touring in Turkey is pleasant all year around. This land is a vast open air museum of historical sights left by the warrior Hittites, Phrygians, Persians, Macedonians, Greeks, Romans and Byzantines. Join us on this unforgettable tour to the Cradle of civilizations! - 10 night's hotel accommodation. - Services of professional English speaking tour guide. - Comprehensive sightseeing as specified in the program. - Daily breakfast, 6 dinners, 7 lunches. - Transportation in Turkey by A/C van or A/C deluxe motor-coach depending on size of group.